Women! Where the heck are you?! 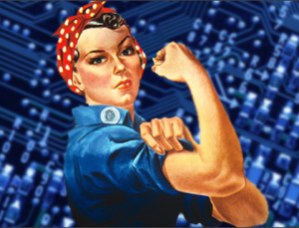 The tech field NEEDS you! From my own experience working in technology, this is an amazing field – one where I have been given countless opportunities to progress, and one in which I am challenged intellectually every single day. I’m paid well (inline with my male colleagues), and when I’ve needed or wanted to seek out new challenges, it’s never taken me long to find something that fits my needs and desires perfectly. Most importantly, my career in technology has allowed me to build a life for myself and my family that is far exceeding expectations. For all these reasons, the fact that we – female tech experts – are still a minority has me dumbfounded, and I’m trying to understand why there simply aren’t more of us. Are we somehow incorrectly introducing technology concepts to our girls in school, inadvertently turning them off to the subject? Or is it because boys have great techie-male role models in the Elon Musks and Steve Jobs of the world, and girls are left with – who? Martha Stewart? Or is it because of reported inequalities in pay, such as those found in the daunting SmartAsset study? This leads me to believe that the opportunities for women in technology are definitely out there – so what’s really holding us back as a gender from entering this field? I call this the glass walls effect. Is it a question of women who are thriving in tech needing to do a better job at speaking up on the merits of pursuing a career in tech? To this end, maybe more women like me need to share our stories to show school-age girls and young women what they’re missing out on. Okay, I’ll admit it – I wasn’t always a lady-geek. Even today, I’m pleasantly surprised when I think about my long and rewarding career in Information Technology. Growing up, I was a scruffy, athletic tomboy who loved the outdoors and had no interest in computers. Granted, it was the ’80s and personal computing was in its infancy and Al Gore hadn’t invented the internet yet. But by the time I graduated from college in 1996, the world was changing fast! The dot-com hey days were roaring, and because I needed a break before starting grad school, I agreed to co-found a technology consulting firm. In the beginning, I was responsible for the business side of the startup and my partner was focused on all things tech. But once the business was in good standing and clients were banging down our door, I found myself watching my partner over his shoulder and learning everything I could – from simple troubleshooting to system administration and software development. At first, customers would call and ask to speak to him. Then, one afternoon he answered the phone and the client asked to speak to me about a technical problem. I guess that was the moment I first considered myself a technologist, and from that day on I haven’t looked back. My partner and I quickly grew that company to 15 employees and several dozen national and multi-national customers. I felt very fortunate for the experience and our success, but it came at personal expense. After nearly six years of working around the clock, I yearned for less – i.e., fewer clients, fewer employees, fewer responsibilities, and, in return, more time to dedicate to what I enjoyed most about working in technology, which was being the lead developer on the projects I’d come to love. This is not to say that I wanted to take on less-challenging work; in fact, quite the opposite. I wanted more time to delve deeply into the types of complex projects that require dedicated thought, and more time to learn new technologies in order to execute them perfectly. Inevitably, the rapid success of my first venture resulted in me becoming spread too thin. So in 2001 I branched out and set up my own “boutique” software consulting firm, hiring one other senior level developer. We occupied two offices in a charming-yet-haunted Victorian office building in downtown West Chester, Pa. It was a heavenly four years, where my technical and business skills blossomed – that is, until life threw me a curveball. Running a company, no matter how small, still took a lot of time to keep the pipeline well-stocked and clients happy. When I became a single mom, I knew I needed to focus more time on my three toddler daughters. I reluctantly closed shop in 2005 and took a position at a privately owned, northern Ireland-based pharma company. It took me less than a week to find what turned out to be a stellar Senior Developer position – one in which my boss had no problem with me leaving in the early afternoon so I could be with my kids and then get back online to finish my workday after they went to bed. I only needed this arrangement for a couple of years, but even now – a decade later – my daughters recall fond memories of the daily trips to the park and swimming pool we took during that time. Let’s face it, ladies: There aren’t many careers that provide this level of flexibility while paying their employees well. And furthermore, my need for a flexible workday wasn’t viewed unfavorably by my employer, so it didn’t hold my career back. I was promoted twice during my eight years with the company, and they invested tens of thousands of dollars into me becoming their go-to expert in ITIL – skills that I continue to lean on heavily these days in my role with the Learning Lab. Moreover, when I later felt it was time to seek out new challenges, I was able to find and secure my current position at Wharton. I looked at dozens of job openings, but this one was by far the most appealing. The rest is history, really – the choice was mine, and within no time at all I’d landed my dream job (where I still pinch myself daily). The Learning Lab team is simply awesome, supported by a larger IT culture and organization that is forward-thinking and embraces innovators. It is a place where everyone is encouraged to speak up and, more importantly, a place where the senior leadership actually listens. Unfortunately, it’s also a place where women remain vastly underrepresented – and not because we hiring managers don’t want to bring more women on board. It’s because we see far fewer female applicants than men. I know at this point I sound like a broken record, but I’m going to ask it again anyway: Women! Where the heck are you?! If you’re on the fence about joining my field, please reach out and let’s talk about it: stoms@wharton.upenn.edu or @sarahetoms. I truly mean that – because women truly mean something to this industry, and we need you!